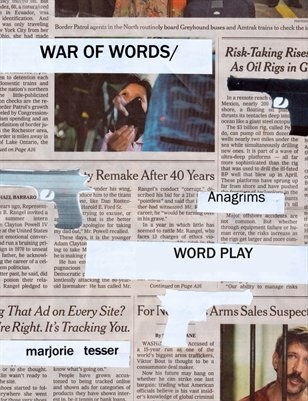 WAR OF WORDS/ WORD PLAY is poem and collage. The canvas is the newspaper, last century’s major news organ. “Anagrims”(slant anagrams) and free vector images are deployed, carefully or scattershot, in juxtaposition to the contents of the paper. Machineries of destruction, as are seen daily in any newspaper, are re-purposed to something gentler. The work is optimistic-- despite our atavistic tendencies towards violent conflict, imagination can engender change.